OPPOSITION Leader Tony Abbott has used his Budget reply speech to unveil a bold plan to increase the number of Year 12 students learning a foreign language to 40% within a decade. Mr Abbott revealed little in the way of detail during his 30-minute speech, instead listing a range of well-known policy priorities. Chief among those was his intention to repeal the carbon tax. "Abolishing the carbon tax would make every job in our economy more secure," Mr Abbott told a packed House of Representatives. His foreign languages policy announcement picked up on the "Asian century" theme used so frequently by the Gillard government. "We are supposed to be adapting to the Asian century, yet Australians' study of foreign languages, especially Asian languages, is in precipitous decline," he said. "The proportion of Year 12 students studying a foreign language has dropped from about 40 per cent in the 1960s to about 12 per cent now." The Opposition Leader accused the Gillard government of playing the "class war card" in Tuesday's Federal Budget. "It cancels previous commitments to company tax cuts and replaces them with means-tested payments because a drowning government has decided to portray the political contest in this country as billionaires versus battlers," he said. "It's an ignoble piece of work from an unworthy Prime Minister that will offend the intelligence of the Australian people." Mr Abbott continued his recent habit of referring to the John Howard government as a "golden era", and said the current government was "too proud" to adopt his polices. Claiming Treasurer Wayne Swan was suffering "surplus envy", Mr Abbott cast doubt on the projected $1.5 billion surplus contained in the Budget. "How can the Treasurer be so confident of next year's skinny surplus when this year's deficit, forecast to be $23 billion in last year's budget, has now grown to $44 billion?" "The forecast surplus relies on the continuation of record terms of trade even though growth in China is moderating and Europe is still in deep trouble. "Yet on Treasury's own estimates, a decline in the terms of trade of just four per cent would turn the surplus into a $1.9 billion deficit next year and $5.1 billion the year after." 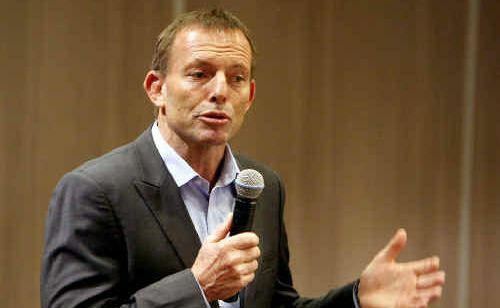 As he has done in numerous recent speeches, he detailed what the first year of an Abbott government would look like. "On day one, a new government would order the carbon tax repeal and accept Nauru's standing offer to reopen the detention centre," he said. "Within a week, the navy would have new orders to turn around illegal boats. "Within a month, the commission of audit would be making government more efficient. "Within three months, the parliament would be dealing with carbon tax, mining tax and border protection legislation. "Within a year, national infrastructure priorities would be agreed and there would be more cranes over our cities." Mr Abbott restated his intention to introduce a paid parental leave scheme, saying it was a "workplace entitlement, not a welfare benefit". He took aim at the long-term unemployed, vowing to make work-for-the-dole, or something similar, mandatory for people under the age of 50 who are long-time recipients of welfare. He also said welfare quarantining for long-term unemployed "should be extended from the Northern Territory to the rest of the country". Set target of 40% of Year 12 students taking a language other than English within a decade. Commitment to paid parental leave scheme. Repeal carbon and mining taxes. Make work-for-the-dole mandatory for long-term unemployed under 50 years of age. Extend welfare quarantining for long-term unemployed across the country.